With the kids both in school, when Valentine’s day comes around, we like to have fun with our Valentine’s Day cards that the kids take to school. Each year we try and do a fun homemade Valentine cards for the kids. My four-year old will be taking heart-shaped chocolate chip cookies to her preschool class. 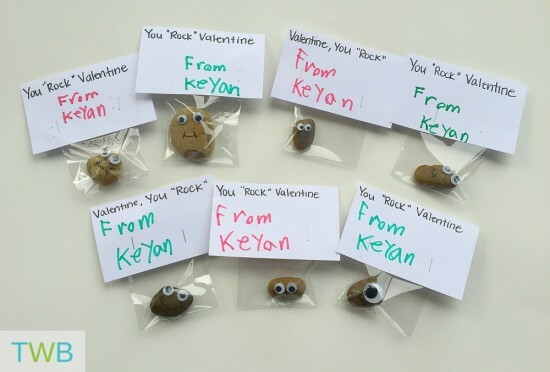 My six-year old will be taking these adorable Homemade Valentine Cards – Pet Rock Cards. They are so cute and really easy to make so I thought I’d share. The best part is, the kids can help out with a lot of it! 2. Use the sharpie to make smiles on the rocks. This is where the kid’s can start helping you out. 4. On the cue cards, you can write something cute like, “Valentine, You Rock!” Then have your child sign their name on each card. This is fun for them and a good way to practice printing their name. 5. Staple each cue card to the top of the plastic bag. And voila, Pet Rock Homemade Valentine Cards for the kids at school! Do you like to make homemade Valentine cards? If so, check out this Pinterest Board for more homemade valentine cards that you you can make at home as well as fun Valentine’s day crafts.